Kerry–based Griffin Brothers Contracting Ltd. was honoured with a Distinction at the 2018 NISO All-Ireland Occupational Safety Awards. Building Ireland touched base with director John Griffin to discuss what this prestigious accolade means to the Castleisland-based, family-run building and civil engineering contracting firm which has been setting the standards for four-and-a-half decades. At the Great Southern Hotel in Killarney on October 12th, 2018, local firm Griffin Brothers Contracting was amongst those to have their rigorous Health & Safety practices acknowledged by a Distinction at the 27th annual National Irish Safety Organisation (NISO) awards. Established by Monty Griffin in 1973, Griffin Brothers is a family-run firm which has completed a number of prestigious projects across a wide range of sectors including commercial, industrial, residential, hospitality, leisure, civils, demolitions, restoration, educational, health and bespoke private luxury homes. Griffin Brothers believe that strong teamwork between clients and designers is key to the safe and successful delivery of every project to the highest standard, on time, to specification and within budget. Practical experience, technical ability, motivated management and supervisory teams ensure that they are particularly efficient and capable, the Castleisland-based firm continuously striving to expand its list of satisfied clients. As a company, Griffin Brothers Contracting are dedicated to maintain the highest levels of Health & Safety on each project and site. Their Health & Safety system has been accredited to an A grade standard by Safe-T Cert while, as members of NISO, they have received numerous awards and distinctions throughout the years. Griffin Brothers’ Quality Management System is certified under the ISO 9001:2015 Quality Management standard, which was implemented by management to ensure the company is run efficiently, effectively and consistently, meeting and exceeding client requirements and expectations. Meanwhile, under Griffin Brothers’ Environmental Management System ISO 14001:2015, all employees and subcontractors must comply with their Environmental Policy. The company complies with all legal requirements with regard to the environment and do all that is reasonably practicable to prevent and minimise any negative impact on the environment. Over the past four-and-a-half decades, Griffin Brothers Contracting have become synonymous with the highest-quality workmanship and project delivery throughout the Greater Kerry, Cork, Limerick region, working for a veritable who’s who of clients including, but by no means limited to, the OPW, Cork County Council, Liebherr, Omniplex Group, South Western Fisheries Board, Kerry Airport, Mondelez, Kerry County Council, Munster GAA, Coolmore, Kerry Group, Kerry GAA, the HSE, Department of Education, Dairygold, Bus Eireann, UCC, Astellas Pharma & Killarney Hotels Ltd (5 star Europe & Dunloe Hotels). This project encompassed the substantial construction of a three-storey entrance atrium and complete internal refurbishment to the existing building without interruption to the functionality of the live campus. At the time of writing, Griffin Brothers were also finishing a prestigious 40-apartment development at the five-star Hotel Europe & Resort in Killarney and had just commenced work on a 36-bedroom extension to the Dingle Skellig Hotel in addition to the refurbishment of the main foyer, bar and restaurant. In addition to this, Griffin Brothers have commenced construction of a new extension to the existing casein plant building at Arrabawn Co-op in Nenagh, County Tipperary. Some other landmark projects completed by Griffin Brothers include Tralee Bay Wetlands Centre, Abbey Court Retail Development, Tralee Omniplex, Killarney Omniplex, the Randles Court Hotel, Bus Éireann’s Tralee bus station and Fitzgerald Stadium as well as bridge construction works, Kerry Airport, Munster GAA Headquarters, Ballygarry House Hotel, St John’s Church in Ballybunion, St Michael’s Church in Sneem, Liebherr Shipping Building at Fenit Harbour, Kerry County Museum, Siamsa Tire, Kerry County Council Offices, Parknasilla Resort & Spa and numerous housing developments throughout Kerry and Cork as well as a high-end residential development at Notting Hill, London. Abbey Court Retail Development is situated on one of the premier shopping streets in Tralee, fronting onto a pedestrianized street that links the town square and the mall to the main public car park. The building is a prominent fixture in the locality, featuring aesthetically-pleasing limestone dura cladding with light provided by way of large structural glazed units. The Randles Court Hotel project encompassed a new four-storey bedroom extension over the existing pool and spa. A new 1,800m2 underground carpark comprising two levels was constructed within a confined area on the hotel grounds, with all works accomplished with minimal disruption to the functioning of the hotel and their guests. The development of the home of Kerry GAA at Fitzgerald Stadium comprised a fundamental upgrade of the existing grounds to bring it up to par with the top sporting facilities in Ireland. The main scope of works involved the construction of a reinforced concrete building over three floors with the roof acting as the new terrace that would cater for up to 4,000 extra spectators. Internal works involved the construction of dressing rooms, gym areas, cryotherapy pool, match analysis room and a range of other facilities. Major upgrade and refurbishment works were also carried out to the Dr O’Sullivan Stand, including new wheelchair and lift access areas. 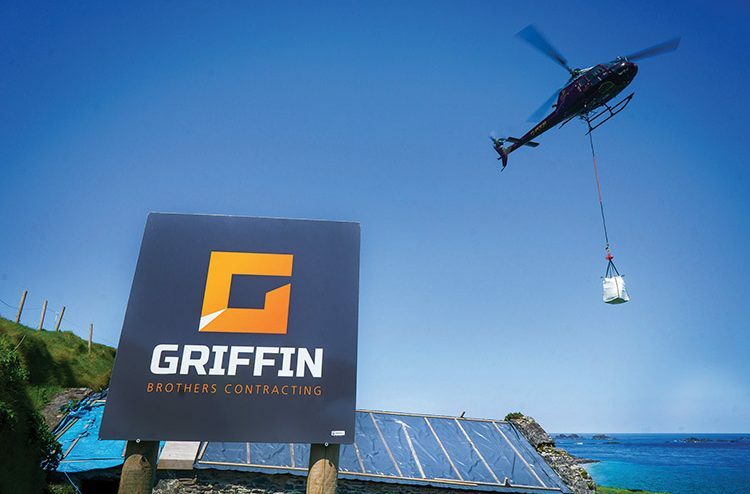 Direct gainful employment is generated for a core staff of circa 50 as well as a select team of loyal subcontractors who work for Griffin Brothers on a regular basis. “Our workers are key and we are very fortunate to have such great staff and we’re delighted to get such loyalty from our staff and we look after them in turn, so it works both ways. There’s no consistency in construction down south at the moment, with a lot of peaks and troughs, so it’s a challenge to secure projects on a consistent basis. Having said that, we’ve enjoyed a few good years and have pulled off some large, high-profile projects in recent years in Kerry, where we are now firmly established as one of the leading main contractors John continues.